Owl's Head Lighthouse was built in 1825 and marks the south side of the entrance to Rockland Harbor, in Maine. The unique name comes from the observation that when one is looking from the water, the point resembles an owl's head and there are two caves visible to give the owl his "eyes". The lighthouse itself stands 30 feet tall, but from it's position, the lighthouse actually has a focal plane of 79 feet. 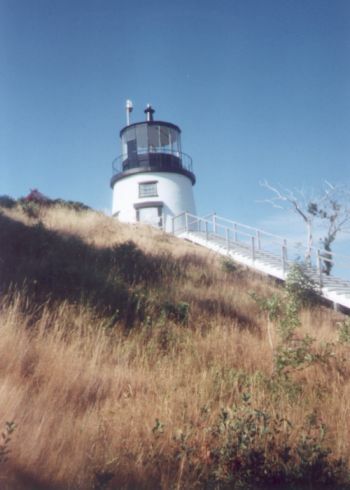 Owl's Head Light was one of the last lights to be automated, which took place in 1989. The light is now operated by the Coast Guard, which has an officer residing at the keeper's quarters. The view from the lighthouse is wonderful and when we visited the lighthouse, we actually saw a family of seals playing in the water below.